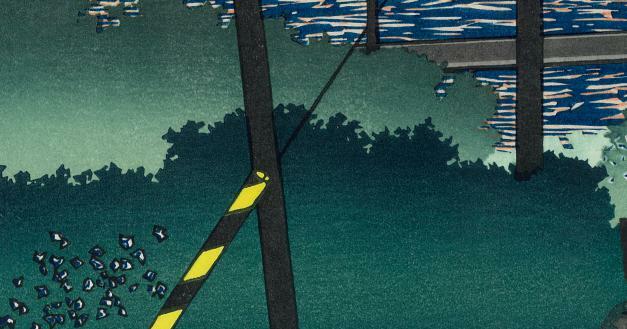 Such a woodblock-print you have never seen before! never seen in any other kind of arts. Here is Tappizaki in Tugaru located at the north end of Honshuu island in Japan. 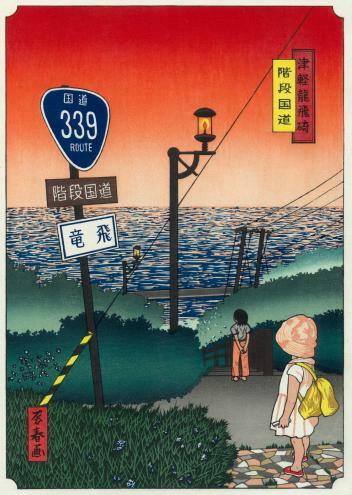 The Route 339 at the cape of Tappizaki have unique sightseeing place called “Kaidan Kokudou”. In this place, the road is Stair lane impassable for vehicles, even though National highway. This is also such a nostalgic art which makes you remember the old memory when you are child. The sunset ocean wave is represented by Horishi technic with very delicate, but very boldly. 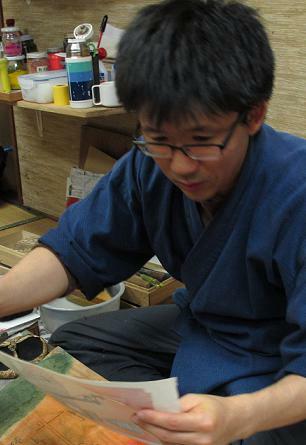 You might think it is impossible to carve woodblock by hand to make it. But, it is actually existing the unique world in woodblock using the amazing technic by hand. Surishi has special gradation technic to describe the sky turned to red, and for Green color in leaves and trees. Surishi make it possible due to print several times superpose. Three is Surishi who is super technician to print from the carved woodblocks. Let me introduce Eshi, Horishi, and Surishi who engaged for this production as follows. 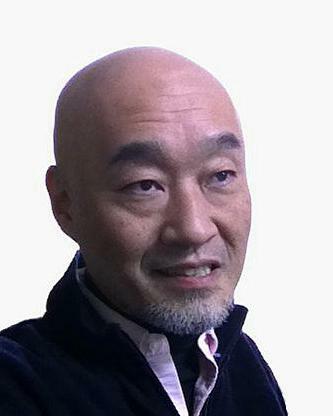 In 1997, he invented a digital-art by his original technic, produced with the point of freehand drawing carefully on a Washi (Japanese traditional paper), making full use of PC, digital camera and printer. 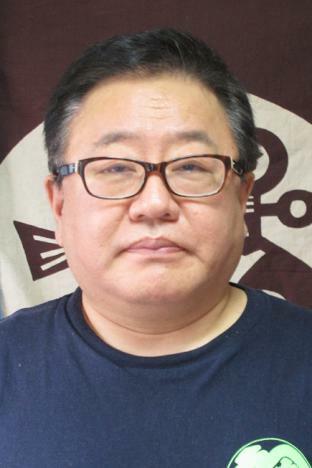 He is the painter who is unique in the world, as he can draw the world of the Ukiyo-e using the modern latest tool, while having his opinion “Ukiyo-e should not been antique”. From childhood, he was highly influenced by Ukiyo-e, especially Hiroshige Utagawa’s landmark pictures. And, he has the view of world should be called “Hiroshige of the Heisei era”, warm and slightly nostalgic style are his characteristic, even representing modern landscape. As he is also very interested in traditional technique of woodblock print by Horishi and Surishi, it was able to become the woodblock print from his representative work “Stair lane on Route 339 in Tugaru Tappizaki”. He was born in 1980. He is a super technician belonged to S.Watanabe Color Print Co. He had learned wood carving art at Traditional Arts College of Kyoto, but he has engaged in Surishi since he entered the S.Watanabe Color Print Co after graduation. He has 7 years career, and he has obtained high technique for Surishi. 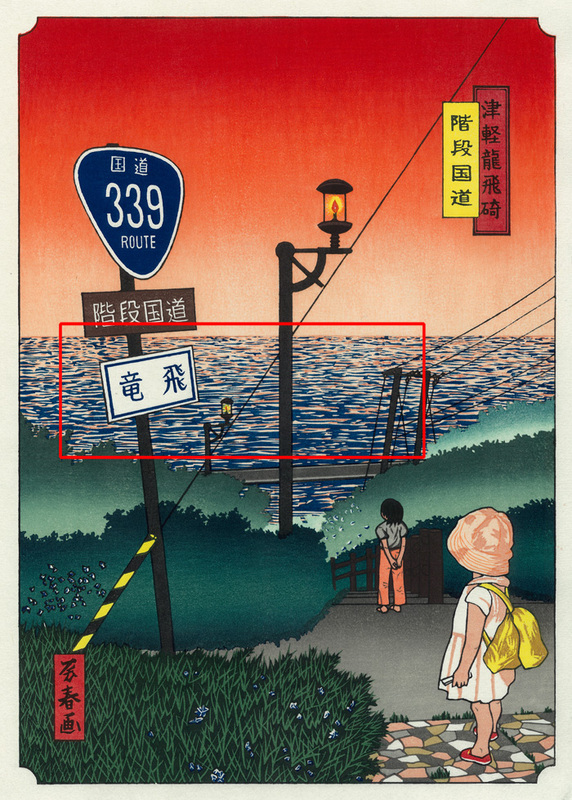 S.Watanabe Color Print Co is famous for publisher of Shinhanga represented by Hasui Kawase. 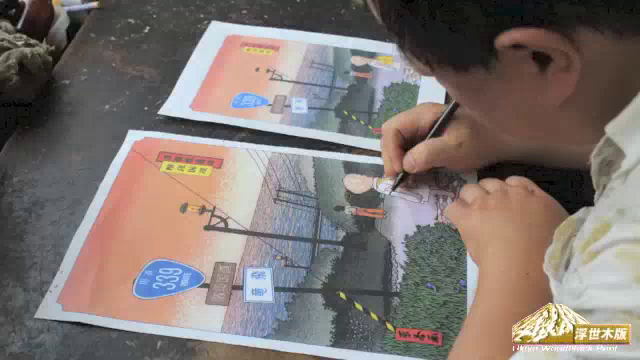 A lot of Surishi’s printing techniques including gradation and roughish are used in Shinhanga. In this work, this gradation technic is made use of red color in sunset sky and Green color in leaves and trees. As he is belonged S.Watanabe Color Print Co., he can make use of the expression method.